Reese Cutler loves the feel of damp, rich soil and the scent of anything that blooms. A strong faith navigates him through the roughest waters, and nothing makes him happier than watching the family business grow–until Peyton Langley visits the nursery, presenting a partnership venture with her fledgling floral boutique. Peyton Langley has transplanted from Kentucky to Clover Cove where she's determined to grow her own floral shop. Work keeps her busy, and she has no desire to learn more about God–or ever set foot inside a church, save for the weddings that showcase her impeccable designs. 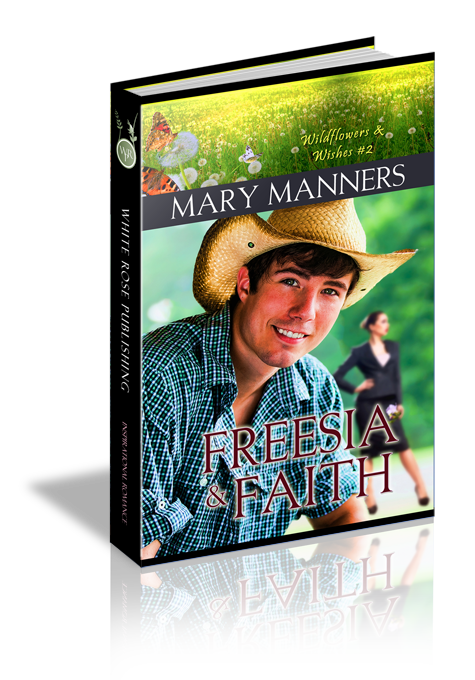 Until she meets Reese Cutler, and his faith and gentleness steal her heart. At odds over business, Reese and Peyton can't deny an attraction in all other areas–including the desires of their hearts. But will conflicting goals–and Peyton's lack of belief–destroy them, or will faith find a way to knit them together...forever? Reese Cutler hoisted bags of potting soil two at a time from a stacked palette on the ground, and then tossed them into his truck as he whistled along to a snappy tune pouring from Cutler Nursery’s stereo system. Sunlight, bright and hot, scorched him through the fabric of his black T-shirt while sweat puddled at the small of his back. He had only a couple hours left to get the soil loaded and delivered before he and Wyatt had to head over to the tux shop for a fitting. Relief flooded over the fact that his brother was taking the marriage plunge and not him. He wasn’t ready for the whole white-picket-fence-and-kids scenario. Not that the thought hadn’t ever entered his mind, though. Just not…yet. Besides, tuxes weren’t his cup of tea, either. Give him his jeans and boots, and he was happy as the day is long. Of course, Wyatt didn’t seem to mind the fancy stuff. Seemed he’d developed a taste for it during the half-a-decade he’d spent pounding the halls of an upscale management firm in New York City. But Reese and Wyatt were as different as filet mignon and ground beef, and fancy stuff was just one of the many reasons Reese had no plans to marry, at least not anytime soon. He had too much living to do before he got tethered to a woman…Although, he had to admit Wyatt had done pretty well in that department—Kami Moretto was more laid back than most, and he’d be glad to have her for a sister-in-law. Reese continued to toss the bags into the truck bed, struggling to dismiss the thought that really got his goat and had nothing to do with his brother’s wedding. But his efforts were of no use at all. One glance across the parking lot to the brownstone building a few doors down—the one boasting new signage and draped with a brand-spanking-new green and white striped awning—had that thought tumbling right back. The building had been rented out from under him. His plans for expanding the nursery—for adding a grafting room—were destroyed in one stroke of a pen. He’d returned home yesterday to find that Wyatt and his mom had leased the building to some out-of-towner so she could open a floral shop. And, to top it all off, they’d agreed to partner with her—and without consulting him. The month-long hike along the Appalachian Trail had been the first vacation he’d managed to take in more than two years, and they’d gone right over his head just because he was in the backcountry and without cell phone service. He probably should have made his plans to use the space for a grafting room a bit clearer. Perhaps in writing—with a permanent marker—across Wyatt’s forehead. Peyton bit back a scathing retort as she plucked a strand of hair from her eyes with freshly-manicured nails in the sassy shade of Cajun Shrimp. She’d splurged, having worn her own to ragged nubs as she spent the entire past week getting the floral shop cleaned, stocked, and ready for business. Good thing, too—her first order had come in just that morning. Beads of perspiration gathered along the nape of her neck. She wanted nothing more than to retreat to her air-conditioned car and head back to the floral shop. She had work waiting on her—loads of it, thank goodness. But the future of her business hinged on finalizing the deal here at Cutler’s Nursery. She needed flowers at an exceptional price, and the Cutlers had them in spades. All that stood in the way of cementing the deal was a facetious, sweaty excuse for the male species. Peyton forced the thought from her head as she scanned the length of him, noting faded jeans torn with gaping holes at the knees and a black T-shirt that she was sure had seen better days. Hair the color of rich maple syrup spilled from a Tennessee Smokies baseball cap to curl at the nape of his neck. Scuffed cowboy boots, caked with mud, might have been hand-me-downs from a great-grandfather. So what if his biceps strained the T-shirt and his eyes looked like warm, dark chocolates. “I was gone the past month…a little side trip to clear my head. I guess I’m out of the loop.” Reese scrubbed a filthy hand over his stubbled jaw as his dark eyes captured hers and held tight. His voice was suddenly clipped, and Peyton wondered what she had done to set him off. Did he really dislike her shoes that much? “Let’s see what all the fuss is about.” Reese took the brochures. “No, not directly. I’ve already been over that with Wyatt, and he’s fully informed. I was merely an apprentice then with no real control over any of B and B’s day-to-day operations.” She’d tried to warn her supervisor, though, about the faulty equipment, but to no avail. She’d been branded as a whistleblower and let go from her duties in a less than dignifying fashion. Now, her only hope was to make a go of her own business. She had to make it work. There was no other option. Peyton frowned at Reese’s careless manner with the materials that had taken countless hours to design and create. She’d done them herself, thus saving a good portion of her meager start-up budget for the floral shop. “Whoa, easy there.” He dropped his bottle of water, splattering them both as he caught her just before her forehead connected with the truck’s tailgate. “Are you OK?” His T-shirt held the warmth of the sun as his arms, strong and sure, circled her. Peyton’s pulse stammered and a freight train screamed through her ears as the nursery swirled around her before coming back into focus. She drew a breath and pushed back from Reese, staggering as her equilibrium righted. She bent, tugged at the uncooperative shoe, and groaned as the genuine leather upper separated from the spiky heel with a sick-sounding squish while her bare toes, painted in the same perky Cajun Shrimp as her fingernails, curled along the muddy ground. Mortified, she released the mangled shoe and carefully righted herself to find Reese laughing. “No, thank you.” Peyton managed to hop away from him a few steps before nearly stumbling once more. She gave up the fight, slipped her second shoe off, and, hiking up her pencil skirt just enough to gather a bit of leverage, squished across the lot, hobbling toward the shop. Glancing back as she neared the sidewalk, she was mortified to find Reese doubled over against the bumper of his truck, belly-laughing. Dismissing him with a stiff shake of her head, she caught sight of herself in the reflection of a car window. The image had her scowling in mortification. Not only had her hair loosed from the sleek chignon she’d painstakingly twisted that morning, but smudges of dirt shadowed her right cheek. To top it off, her blouse was splattered with mud; might as well pair it with Reese’s ripped jeans. Now that would be a vision. A quick tap on her shoulder launched her pulse to a gallop.